Bijapur city is the district headquarters of Bijapur District of Karnataka state. It is also the headquarters for Bijapur Taluka. 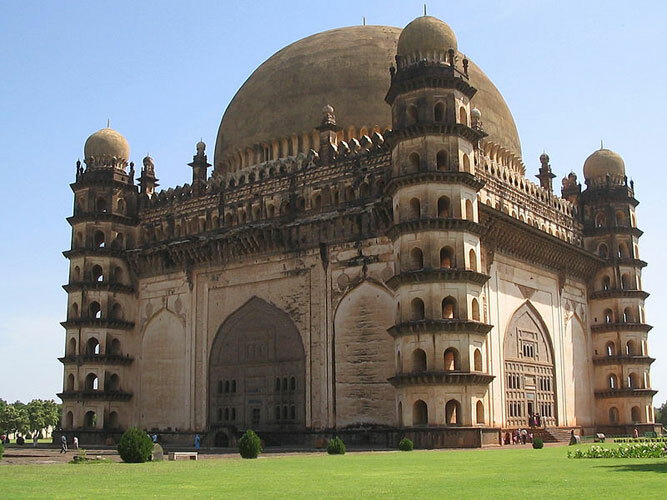 Bijapur city is well known for its historical monuments of architectural importance built during the rule of the Adil Shahi dynasty. Bijapur is located 530 km northwest of Bangalore and about 550 km inland from Mumbai, and 384 km west of the city of Hyderabad. Bijapur's urban population as per 2011 census is 326,000, perhaps the 9th biggest city in Karnataka. Bijapur City Corporation(BCC) is the newest Municipal Corporation formed under the KMC act along with Shimoga and Tumkur Municipal Corporations. The other existing city corporations in Karnataka state in descending order of population are Bengaluru, Hubli-Dharwad, Mysore, Gulbarga, Belgaum, Mangalore, Davangere and Bellary. Administratively, Bijapur district comes under Belgaum division along with Bagalkote, Belgaum, Dharwad, Gadag, Haveri and Uttara Kannada (Karwar) districts. Gol Gumbaz, The Archaeological Museum, Ibrahim Rauza, Malik-e-Maidan, Upli Buruj, Chand Bawdi.